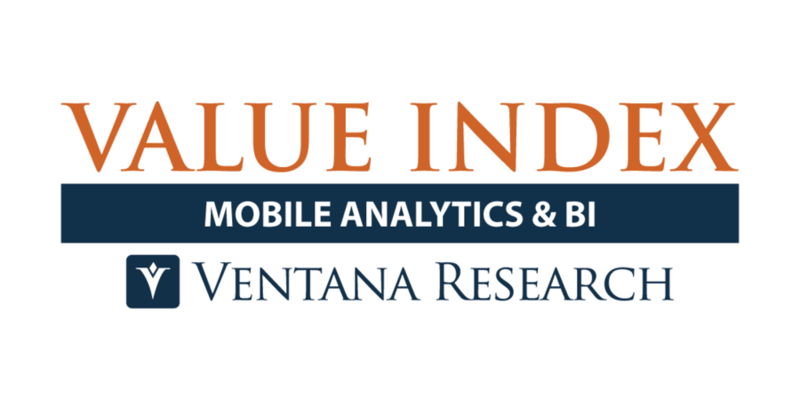 BEND, OR, February 05, 2019 /24-7PressRelease/ — Ventana Research today released its 2019 Value Index for Mobile Analytics and Business Intelligence, a quantified, research-based index evaluating technology providers and products. This Value Index assesses product adequacy across a broad range of analytics requirements needed for enterprises to succeed in a mobile environment. Using this Value Index, business and IT organizations utilizing analytics and business intelligence in on-the-go applications or mobile environments will be able to evaluate Business Intelligence software and examine vendors’ offerings in the context of their own mobile analytics requirements. Ventana Research’s Value Indexes are the result of more than three decades of experience and knowledge of the market for data and analytics. It provides an in-depth analyses of technology suppliers’ products and evaluates their differences. The Value Index for Mobile Analytics and Business Intelligence is based on a comprehensive examination of fifteen vendors’ products in seven evaluation categories, five that evaluate the products’ ability to support the breadth and depth of business needs around analytics and two that address vendor validation and total cost of ownership/return on investment. The 2019 Value Index for Mobile Analytics and Business Intelligence identifies the companies that deliver the highest value based on an overall weighted evaluation. The Overall Value Index Leaders in the 2019 Value Index are MicroStrategy, Infor and Information Builders. Companies that score in the top three in any category earn the designation Value Index Leader; Infor has done so in four of the seven categories; IBM, Information Builders and MicroStrategy are Value Index Leaders in three categories; and BOARD, Domo, SAP and SAS in two categories. All vendors included in the Value Index were required to offer Mobile Analytics and Business Intelligence software as that could be applied across all lines-of-business. The Value Index assesses the effectiveness of each vendor’s support for the buying process and customer assurance. The Value Index is not just a selection of “cool” products; rather than evaluating a vendor primarily on its vision or market execution, the Value Index provides specific numerical ratings, both overall and for each of the seven components of the Value Index, for technology buyers to consider. Organizations can use the Value Index as a guide to assess existing technology providers and determine if their provider best meets their needs today and in the future. Ventana Research is the most authoritative and respected benchmark business technology research and advisory services firm. We provide insight and expert guidance on mainstream and disruptive technologies through a unique set of research-based offerings including benchmark research and technology evaluation assessments, education workshops and our research and advisory services, Ventana On-Demand. Our unparalleled understanding of the role of technology in optimizing business processes and performance and our best practices guidance are rooted in our rigorous research-based benchmarking of people, processes, information and technology across business and IT functions in every industry. This benchmark research plus our market coverage and in-depth knowledge of hundreds of technology providers means we can deliver education and expertise to our clients to increase the value they derive from technology investments while reducing time, cost and risk. Ventana Research provides the most comprehensive analyst and research coverage in the industry; business and IT professionals worldwide are members of our community and benefit from Ventana Research’s insights, as do highly regarded media and association partners around the globe. Our views and analyses are distributed daily through blogs and social media channels including Twitter, Facebook and LinkedIn. To learn how Ventana Research advances the maturity of organizations’ use of information and technology through benchmark research, education and advisory services, visit www.ventanaresearch.com. 3D Printer – Which Material Can Be Used For Printing and Which May Not?